Plugin Company brings merchants simple and efficient solution for independent management of fraud suspicions. The Fraud Prevention & Blacklist extension provides all necessary tools to easily prevent fraud actions and block fraudulent accounts on Magento 2 web stores. Internet fraud became a global problem, putting all websites at risk of being attacked by fraudsters. Handling credit card chargebacks and payment returns ends up in the profit loss and other difficulties for a merchant. With the Fraud Prevention & Blacklist extension, you can get more control over fraudulent actions and prevent your business from losing money. 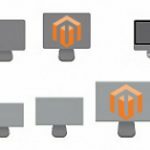 With the extension, you will be able to easily track and manage fraud suspicion orders in the Magento admin, create blacklisting rules based on customer account attributes, and block and blacklist suspicious actions automatically. 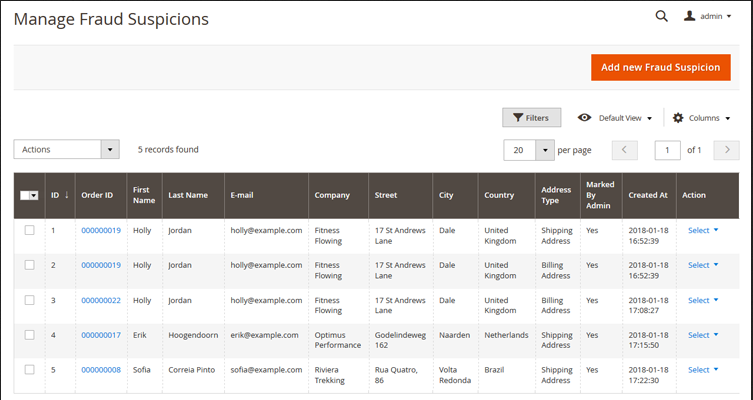 With the extension, you can quickly view, modify and add fraud suspicion records from one place in the Magento Admin. 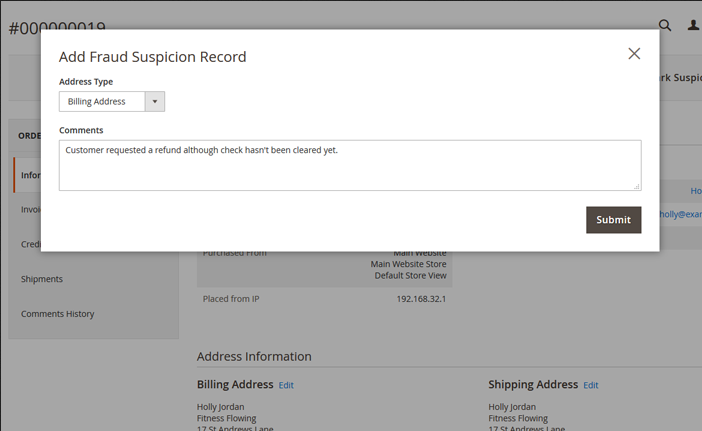 You can mark questionable orders as suspicious in the backend to create a fraud suspicion record. Future fraudulent orders will be automatically detected and blacklisted based on the comparison with the customer attributes defined in a fraud suspicion record. You can create your blacklisting rules combining different customer attributes, like name, address, contacts, IP address, and others. When a customer places a new order on your web store, the extension will check these attributes comparing them with the fraud suspicion records. Blacklisting rules can be set per customer group or store view. The extension enables you to predefine the allowed number of “strikes”, or matching fraud suspicion records, to blacklist the fraudulent actions automatically when this number is exceeded. At the same time, you can whitelist the orders and process them normally if needed. 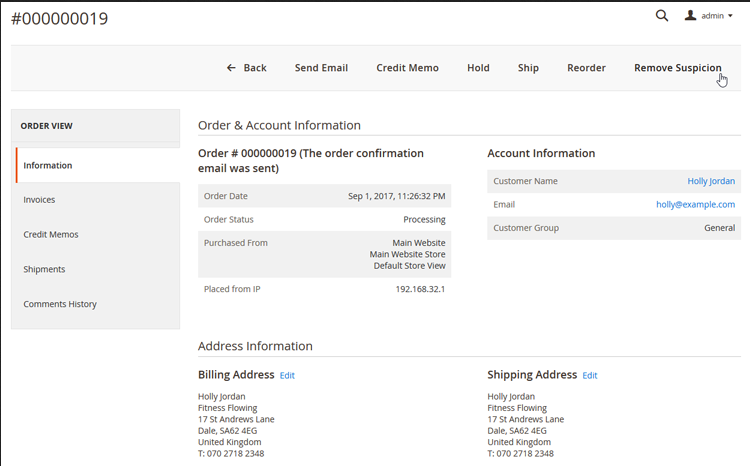 The extension allows blacklisting customer accounts based on their shipping and billing address and placing or updating a fraudulent order. When a customer account is blacklisted, a fraudster will be immediately logged out from your website and blocked from logging in again. In this way, guest visitors will be blocked from completing a purchase if they add a blacklisted address during checkout. It is possible to prevent payment processing of suspicious orders, using the extension’s settings. If a customer adds a blacklisted address during checkout, you can hide a payment methods sections on a Payments page. 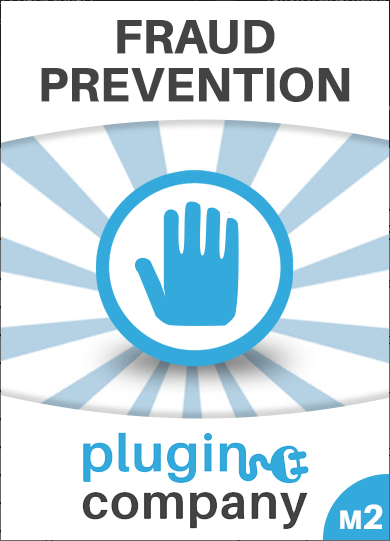 Comparing to some other fraud prevention plugins, the Fraud Prevention & Blacklist extension by Plugin Company does not charge extra subscription fees or service costs. To configure the extension settings, go to Stores → Settings → Configuration and select Plugin Company → Fraud Prevention in the menu on the left. In the Configuration interface, you can modify the extension’s fraud suspicion, customer blacklisting, order confirmation, payment processing, and failed payment transaction settings. 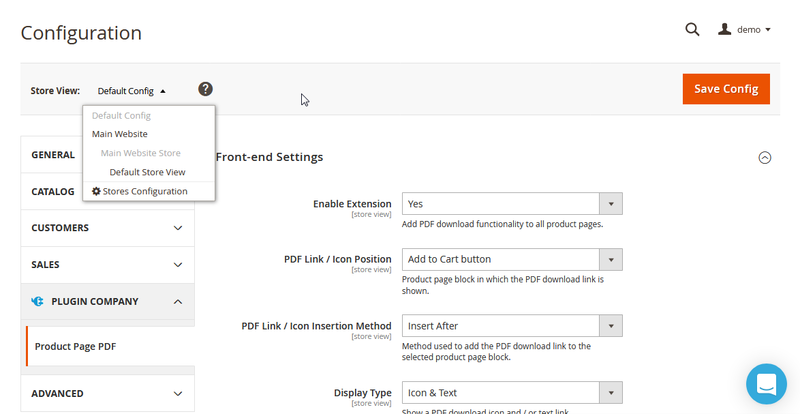 If you run multiple stores on your website, you can configure Store View settings from the drop-down menu. After you make any changes in the settings, always click on the “Save Config” button in the top right corner of the page. First, let’s see how to configure Fraud Suspicion Settings tab. Here you can choose a fraud suspicion address type from three options, whether a customer’s shipping address, billing address, or both of them. It is also possible to choose a fraud suspicion address when you submit a new fraud suspicion. To allow writing comments when submitting a suspicious order, select Yes in the “Enable comments” setting. 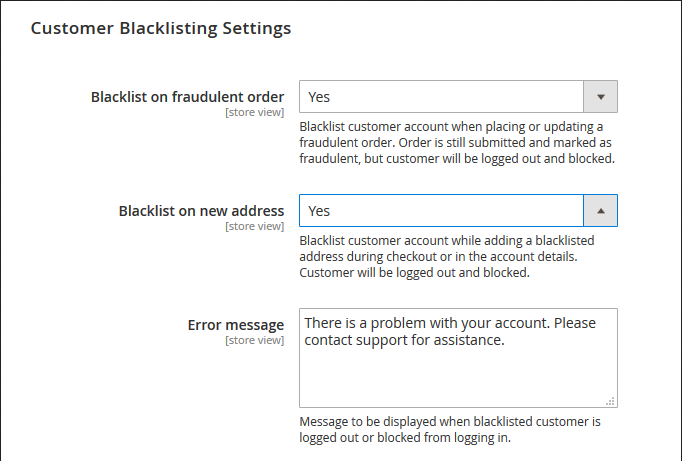 In the Customer Blacklisting Settings, you can decide to blacklist customers when they want to place or update a fraudulent order. In this case, an order will be submitted, but marked as fraudulent. A suspicious customer will be logged out from your website and blocked from logging in again. You can also configure the extension to blacklist customers when they add a blacklisted address to their customer account, or when doing the checkout. In this case, a customer will also be logged out and blocked on your web store. If a customer has not created an account on your store and adds a blacklisted address when doing a checkout, items in their shopping cart will be removed, and their billing information will be deleted. In the “Error message” field you can insert text for the message fraudsters will see when they are logged out, or the extension blocks them from logging in. 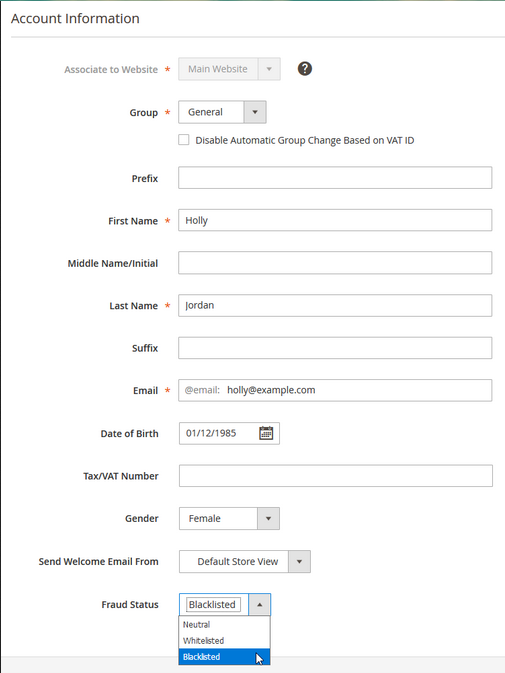 You can modify a fraud status of each customer in their account information details. To do so, navigate to Customers → All Customers, click to edit a chosen customer profile, and select Customer Information → Account Information in the left-side menu. You can change the “Fraud Status” setting choosing it as Neutral, Whitelisted, or Blacklisted. In the Order Confirmation Settings, you can optionally choose to send order confirmation emails when an order is blacklisted. In the Payment Processing Settings tab, you can enable the “Block payment processing” setting. When allowing this option, payment of fraudulent orders will be blocked by hiding the payment section if a customer or guest uses a blacklisted address during checkout. In the Failed Payment Transaction Settings section, you may add a shipping address suspicion strike, a billing address suspicion strike, or both of them at the same time. Fraud suspicion strikes trigger preset blacklisting rules when a payment transaction is not processed. 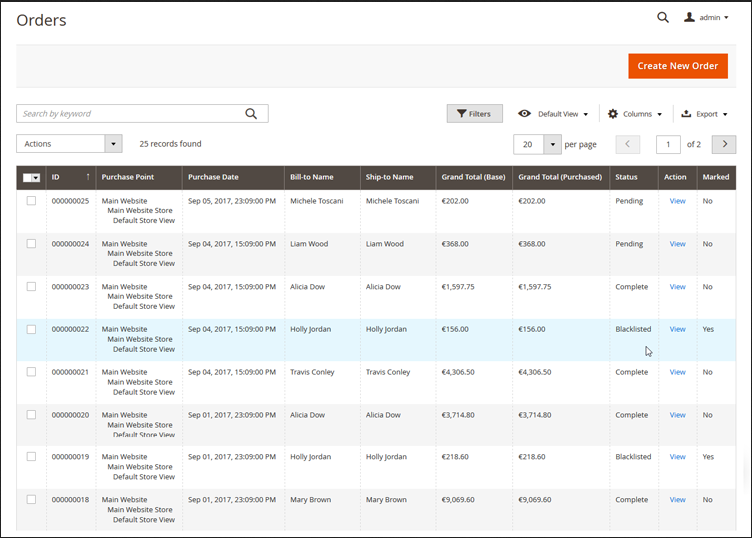 The Fraud Prevention & Blacklist plugin allows admins to easily manage and keep track of fraud suspicions and blacklisted orders in the sales order overview. To reach the sales order grid, navigate to Sales → Operations → Orders. You can filter blacklisted orders by status in the grid. “Marked” column shows if an order is blacklisted. 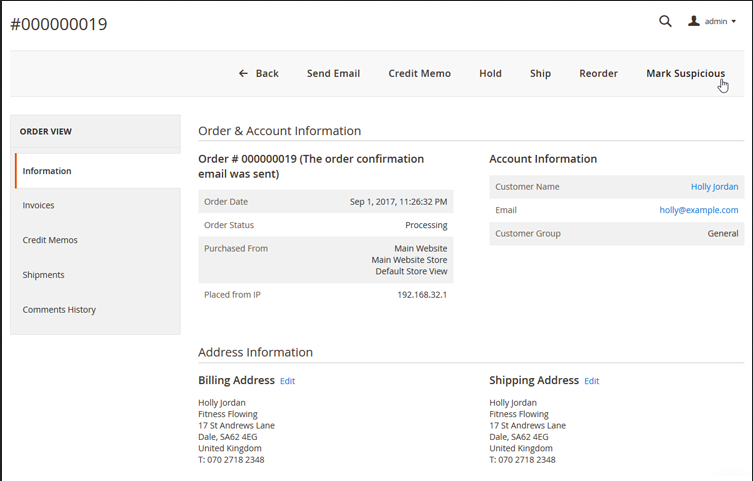 To mark an order as suspicious, click on “Mark Suspicious” in the top right corner of an order view page. 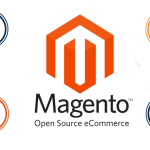 By marking suspicious orders in the Magento Admin, a fraud suspicion record is created. Future fraudulent orders will be blacklisted if detected when referring to the fraud suspicion records. 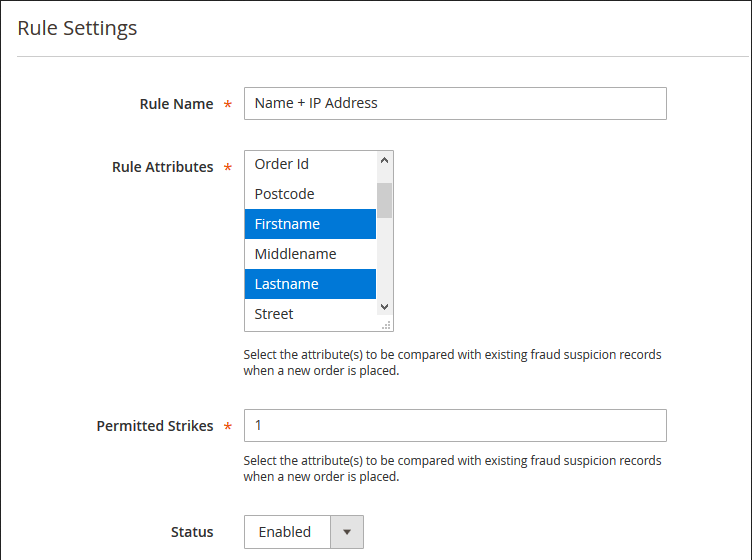 Based on the configured settings, you can choose which addresses should be included in the fraud suspicion record and optionally add comments. If you need to remove fraud suspicion from an order, you can do this by clicking “Remove Suspicion” in the top right corner in an order view page. The extension provides a feature of whitelisting blacklisted orders in one button click. To whitelist an order, click “Whitelist Order” in the top right corner of an order view page. After you click on the “Whitelist Customer” button, a current order and all new orders of a customer will be whitelisted. The extension allows users to quickly manage and modify submitted fraud suspicion records in the backend. To access the grid with all fraud suspicion records, navigate to Sales → Fraud Prevention → Fraud Suspicions. Here you can edit submitted fraud suspicion records, or manually add new records by clicking “Add new Fraud Suspicion” in the top right corner of the page. You can view and change the details of the every fraud suspicion submitted, like customer ID, name, address, contacts, and more. With the extension, you can create custom blacklisting rules based on any customer attribute combination. To manage existing blacklisting rules and add new rules, navigate to Sales → Fraud Prevention → Blacklisting Rules. Each time your website visitor submits a new order, blacklisting rule attributes will be compared with the fraud suspicion database, and the extension will blacklist an order automatically if a match is found. In the Rule Settings, you can enter the name of your rule for admin reference. Then, you can select which rule attributes you would like to be compared with the fraud suspicion records when a customer places a new order. In the “Permitted Strikes” field you should insert the number of the permitted amount of “strikes”, or matching fraud suspicion records. When this number is exceeded, orders will be automatically blacklisted and blocked for shipping. Each blacklisting rule can be enabled for specific customer groups and per store view. 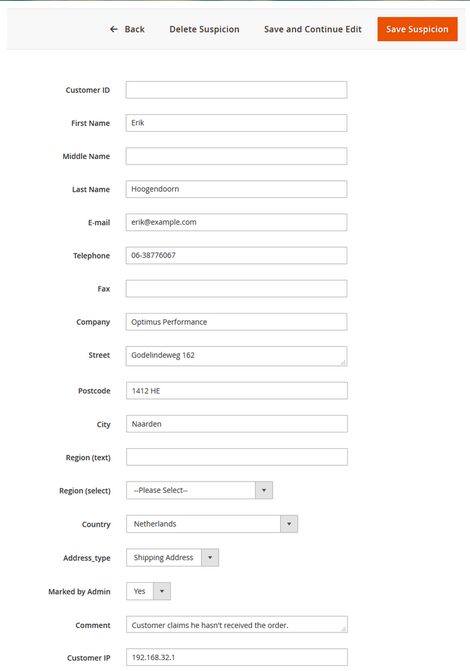 When you configure the extension to blacklist customer accounts on a fraudulent order or new address, blacklisted customers will see an error message with a text you create in the Magento Admin, as seen in the example below. 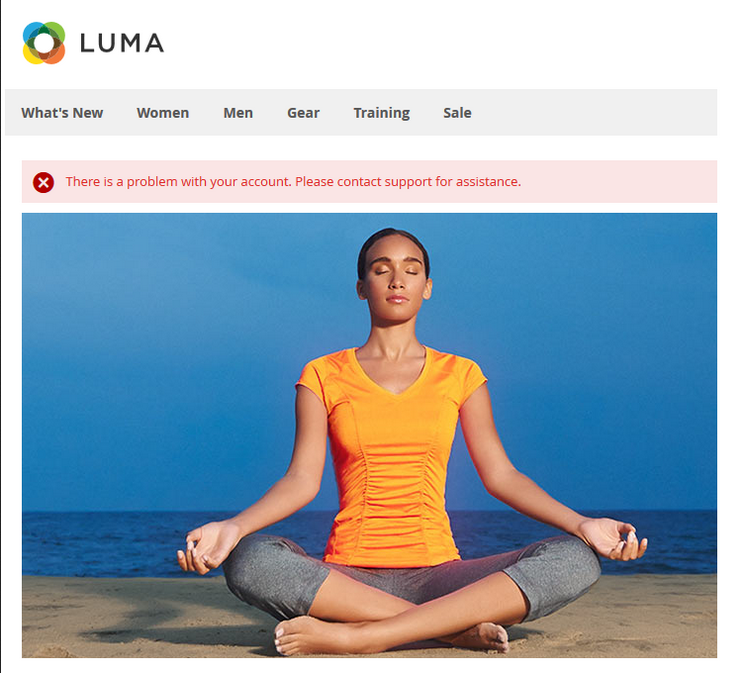 An error message appears on a home page after a blacklisted customer tries to log in to your web store. If a customer or guest is blacklisted during checkout, their shopping cart will be emptied, and payment information will be deleted. When you block payment processing in the backend, a registered user or your web store guest who enters a blacklisted address during checkout will not see a payment methods section. “No Payment method available” message will appear instead of the payment options. The price of the Fraud Prevention & Blacklist plugin for Magento 2 is $69, which is quite fair taking into account the extensive features the plugin provides. 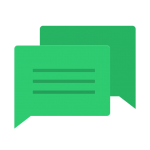 The extension package includes all necessary documentation, one-year free updates, bug fixes and full customer support. The extension comes with a high-quality code that is a fully open source. On top of that, the Plugin Company ensures a money-back guarantee for 30 days.